Citigroup announced solid first-quarter results ahead of Monday’s opening bell. Total revenue of $18.6 billion was in-line with expectations. FICC trading revenue beat expectations, while equities trading revenue was below consensus forecasts. Citigroup announced first-quarter results that beat on the bottom line, but saw equity trading came up short. Shares were little changed following the report. “We remain committed to executing our strategy and continuing to make steady progress towards our financial targets,” CEO Michael Corbat said in the release. Citigroup announced another major shakeup to its senior ranks last week, with president and institutional clients group head Jamie Forese announcing his retirement. Citi is the fourth major bank to report earnings this quarter. JPMorgan and Goldman reported broadly positive results while Wells Fargo provided dissapointing guidance, reflecting the troubles of the embattled lender. Equity trading has been a disappointment across the board. 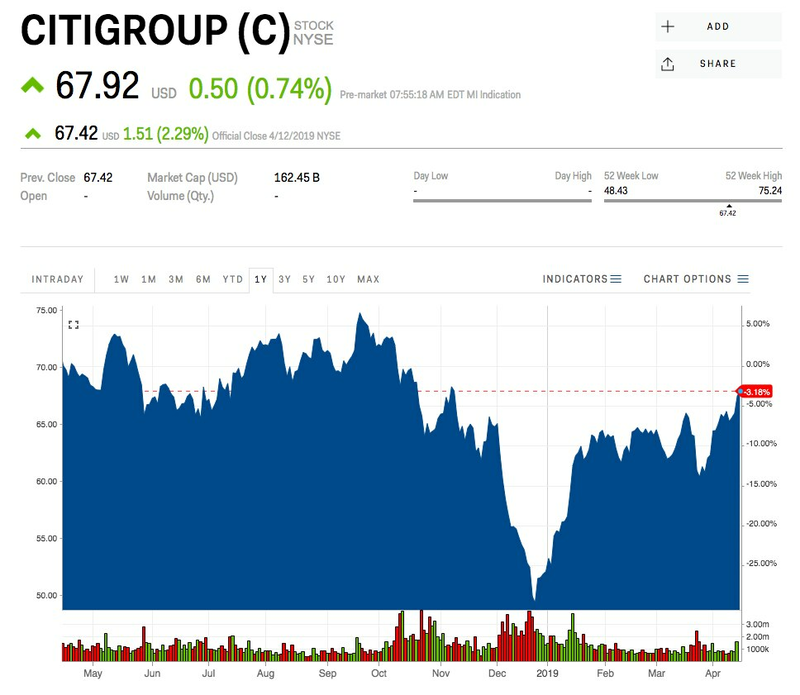 Citigroup shares are up 30% year to date.